AT AMSTERDAM. A busy scene on the River Ij. The port is linked with the sea on one side by the North Sea Canal, and on the other side by the canal locks to artificial channels in what was formerly the Zuider Zee. The North Sea Canal is capable of taking the largest ships likely to use it and is at present 246 feet wide with a depth of 41 feet. The above photograph shows in the centre the Myrmidon, a twin-screw vessel of 6,663 tons gross, at Amsterdam. This ship was built in 1930 and is owned by the Ocean Steamship Co., Ltd.
RHINE barges, river paddle tugs, sea-going tugs, Zuider Zee fishing craft, stumpy North Sea traders, oil tankers and Far Eastern luxury liners - all these help to decorate the ever-changing and picturesque setting of Amsterdam. It is a port of the utmost value to Holland because of its rail connexions with the whole of Europe and its canal connexions with northern Holland. It is not a port in the physical sense, because it is not on the sea and has no natural outlet to the sea. Amsterdam is linked with the sea on one side by the North Sea Canal and its new locks, as large as any in the world, and on the other by the canal locks to artificial channels in what was once the Zuider Zee. In recent years the Zuider Zee has been largely reclaimed, the dam having been completed in 1932. The rival of Amsterdam, in the eyes of most Dutchmen, is Rotterdam. This inland port is equally picturesque, and it too is connected with the North Sea by a canal, the New Waterway. The New Waterway has no locks. Rotterdam resembles Amsterdam in the profusion of its ship types, but it has many more river ships, since it has direct contact with the countries of Europe by canal and is a transhipment port. It has also more shipyards than Amsterdam, though it is difficult to say which port builds the better vessels. Rotterdam is a city of noise and bustle. There is little or nothing medieval about it. Amsterdam cannot be visited without giving the impression of quiet dignity. This impression is heightened by the vistas of old canals, the Dam and the Heerengracht - all eventually flowing into the placid waters of the Ij. The Ij forms Amsterdam’s magnificent waterfront before the Central Station. This glass and steel structure, one of the most striking in the world, is tie work of a firm famous for building marine engines. From the de Ruyterkade (de Ruyter Quay), facing the station, little piers jut out at right angles to the water-front. Here the “local” ships load miscellaneous freight and passengers and leave for places with a characteristically Dutch appearance. The destinations are Zutphen, Deventer, or the Northern port of Groningen, where they build and will sell motor coasters “off the shelf”. Or they may be bound for Antwerp, beyond the southern frontier, Alkmaar (in the province of North Holland), famous for its cheese market, or Zaandam, at the mouth of the pretty little Zaan River. This river connects Zaandam with Alkmaar and runs into the North Sea Canal, past the yard of one of Holland’s most famous shipbuilding establishments - that of the Netherland Shipbuilding Co. Another destination is Ijmuiden. This name, literally translated, means “the mouths of the Ij”, the canalized river upon which Amsterdam is situated. It is here that ships bound for Amsterdam enter the North Sea Canal on their sixteen-miles journey to the port. The North Sea Canal runs through flat country and its course is interrupted only once - by a swing bridge at the little town of Velsen, which carries the railway to North Holland. It is navigable either by day or by night, and after sunset is electrically lit, as are the streets of the city ashore. Amsterdam has always been a port to look ahead, and hence the canal is capable of taking the largest ships likely to use it for a number of years. It is now 246 feet wide, with a depth of 41 feet. Plans are always in hand for an increase of depth and of width in proportion as the size of ships increases. In this connexion reference must be made to the lock at Ijmuiden, one of the largest sea locks in the world. It has been completed with every attention to modern architectural details, a feature in which Dutch architects excel not only at their maritime work but also on shore. Incidentally, it is worth recalling here that the building in Amsterdam known as the Scheepvaarthuis, which houses the offices of all the principal steamship companies and overlooks the port, has been built on a corner site in the semblance of the bows of a ship. Similarly the control houses for the canal locks are circular and resemble the conning tower of a modern warship. This magnificent entrance lock to the North Sea Canal is 1,312 feet in length, 164 feet wide and 49 feet deep. The situation is one of the most exposed in European harbours. If a traveller is waiting to board a ship at the lock on a windy day it is possible for him to lean against the wind, and it is no uncommon event for a ship moored near the entrance to require about an hour to be pulled alongside if the wind is against her, and the sea outside is correspondingly ruffled. The canal is well maintained and wide enough for two of the largest vessels at present using the port to pass. Such a procedure does not generally occur, as there is not much room to spare. On one occasion, however, a new liner, crack ship of the East Indies trade, outward-bound on her maiden voyage, was hit, when halfway down the canal, by a lumbering, deep-loaded incoming freighter, and a big hole was torn in her starboard bow. The impact was gentle; the sound no more than the slamming of a heavy door, accompanied by a scraping. But the damage was such that the ship could not sail. Before tugs had taken her back to her berth at the well-known Javakade (Java Quay), not far from the Central Station, the Amsterdam ship-repairers were ready for her. Such was the spirit of the port that all combined to remedy the damage. Each company did the work in the injured giant’s bow that its equipment best fitted it to perform, and all worked together for the honour of Amsterdam, to get her to sea again. Delayed though she was, she was nearly on schedule at Port Said. That is the kind of port and these are the types of people that we are discussing here. BUSY ROTTERDAM. 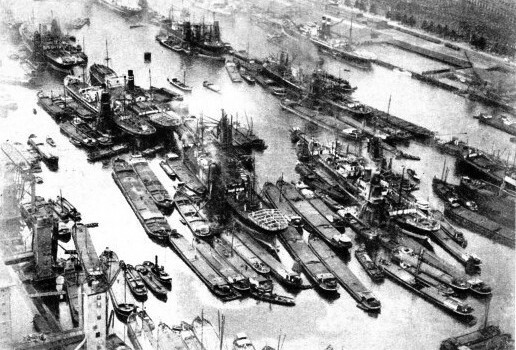 A photograph of the port, showing many of the Rhine barges which are a particular feature of the waterways near the city. The River Maas, which flows past Rotterdam, is an effluent of the Rhine, which connects Switzerland with the North Sea. Rotterdam’s principal link with the sea is the New Waterway, entered at the Hook of Holland. Amsterdam is an easy port to visit, because of the numerous little ferries running from the de Ruyterkade to various points in the harbour. Each of these local services has a number, being known as Ijveer I, II or III, according to its destination. By them most of the points of interest can be visited. For Amsterdam is a simple harbour in that, the water portion comprises the River Ij, running “fore and aft”, merging with the North Sea Canal at one end and broadening into a species of lake at the other, useful in times of depression for laying up ships. Facing the de Ruyterkade are the entrance locks to the North Holland Canal, and an unloading depot for oil and petrol. The main petroleum dock, situated farther down the river, has a total capacity of about 100,000 tons. Oil and general cargoes are not the only reasons for the importance of Amsterdam as a port, for among the largest importers of timber in Europe it ranks after London. Transit traffic is an equally important feature. Much freight is transported to and from the Rhine and its basin. Amsterdam is also a transhipment port for goods from South Africa consigned to Mediterranean ports, for colonial products destined for England and Northern Europe, and for West African products sold to London, America and Mediterranean ports. As transhipment is one of the outstanding features of the port, it is not surprising for the visitor to find that there is a forest of cranes almost everywhere he turns. One steamship company has over seventy at its disposal, and the port has an aggregate of over 300 cranes able to lift all sorts of cargo from one and a half tons’ to eight tons’ weight. In addition, little tugs may be seen, pulling floating cranes on square box-shaped hulls. Some of them have a lifting capacity of as much as 150 tons. Great warehouses flank the quay. Some of the sheds of the companies trading to the tropics have specially heated rooms for storing sub-tropical fruit during the winter. At other parts of the port jetties and piers have been built and equipped with sheds at which ocean-going steamers can berth on the one side and inland craft on the other. Numerous warehouses are situated in the harbour and along the many canals of the town, in which are stored valuable cargoes such as coffee, tea, tobacco, copra, cinchona bark, rubber hides, kapok and the like, which are brought to the Amsterdam market. Large refrigerating stores are built alongside deep water for the frozen meat which comes from South America; other big sheds carry rubber from the Indies. Grain, too, is a cargo which can be seen at any time being drawn from the holds of ocean-going vessels by powerful pneumatic elevators. Some of these deal with no fewer than 250 tons of this golden cargo in an hour. The largest grain silo, as it is called, alongside which the biggest ships tie up, offers elevator space for 18,000 to 20,000 tons of this cargo. So rapidly is this cargo dealt with that the spectator can almost see the ship rising out of the water. It is no uncommon sight to see such a vessel trimming heavily by the bow or by the stern. The unloading is accompanied by the hum of the centrifugal pump that deals with grain. A film of dust hangs over the operation. Other bulk cargoes such as coal, ore and minerals are worked efficiently and economically by floating grab cranes, coal tips, electric transporter bridges and other loading and discharging equipment. 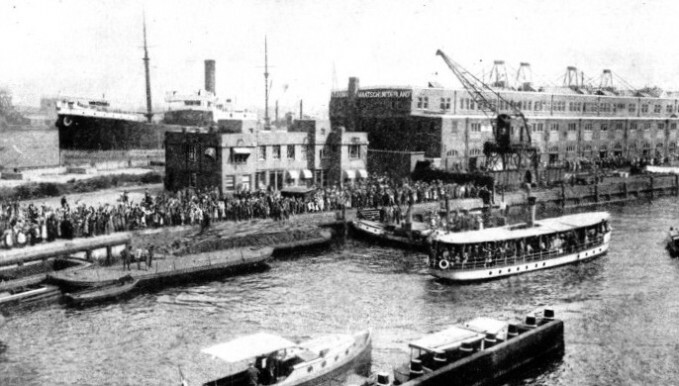 ADMIRING CROWDS THRONG THE BANKS at Amsterdam as an East Indies liner - from which this picture was taken - moves away from the quay to begin a long voyage. Many of the most important Dutch steamship companies use the port as their terminal. Amsterdam is visited also by several of the world-famous lines such as the Hamburg-Amerika, the German East Africa, the Elder Dempster, the Kosmos and the North German Lloyd. Floating equipment is a feature of all northern European ports and adds to the variety of craft that make up the picturesqueness of Dutch waterways. Many of the most important Dutch steamship companies use Amsterdam as their terminal. Important lines of other nationalities such as the Hamburg-Amerika Line, German East Africa Line, Elder Dempster Line, Kosmos Line and North German Lloyd bring a taste of romance in the link which they form between this port and other parts of the world. If we leave Amsterdam by swift electric train, a pleasant journey of an hour and a half brings us to the more prosaic town and port of Rotterdam. Here again we are visiting what is essentially a river port in the sense that a big waterway flows past its quays. But whereas the River Ij in Amsterdam may be best described as a large canal, the River Maas which flows from Rotterdam is a mighty effluent of the Rhine connecting Switzerland with the North Sea. Rotterdam is a centre of intense activity. A visitor, standing on the Maas Bridge, a magnificent steel and concrete structure, may obtain a wonderful panoramic view of the life of the port. Battling upstream is a sturdy river paddle-tug, a large ship nearly 200 feet in length, with two tall hinging funnels and immense paddle wheels thrashing the water. 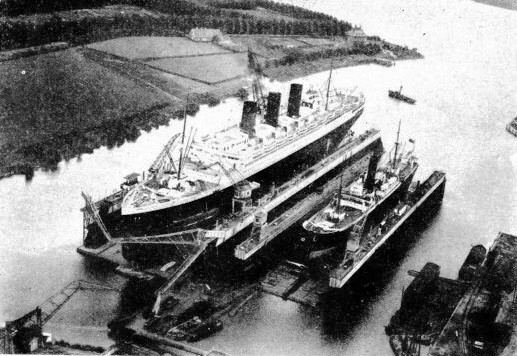 Astern of this are four or five huge barges, probably of 1,000-tons carrying capacity apiece. They are ships with parallel sides except at the forward and after ends. They are so heavily loaded that amidships they are almost awash, and access from the fore to the after end is solely by means of the top of the hatch covers. At the after end are the windows and the brown painted structure of a little cabin, the outside of which may be gay with flowers and festooned with washing. For the Rhine barge, as she is called, is not only a cargo vessel; she is also the home of the barge captain, his wife, his family, and sometimes of his relatives. They spend most of their interesting, colourful and changeful lives in this little craft. A week after the Rhine barges have left Rotterdam they may be unloading iron ore in the grimy Ruhr district of Germany. Then they may proceed almost to the Swiss frontier to pick up another cargo, which by river and canal may take them to places as far distant as Hamburg or Rouen. The Rhine barge is a familiar sight in the port of Rotterdam, more so than in Amsterdam. For in Rotterdam, near the airport, situated close to the water, is a big lying-up ground for barges. During a recent flight over Rotterdam it has been possible for those in the aeroplane to see as many as 200 barges tied in groups wearing that forlorn air which laid-up vessels always have. They are picturesque, even if they do not form part of the active panorama seen from the Maas Bridge. From that point can be seen, on one side, a big transatlantic liner of the Holland-America Line preparing for sea or unloading cargo on arrival. In the distance, moored at dolphins (mooring-buoys), in the middle of the river, are tramps from the River Plate unloading grain, and ore-carriers from Sweden putting ore into barges. Farther down the river are the big shipyards and repair shops. Rotterdam is one of the most famous ship-repairing centres in northern Europe. Here the ship enthusiast can see as many of his favourites as he wishes, some having new bows fitted, others with their machinery removed, others again with broken stem frames, the result perhaps of heavy weather damage. There are many entrances and exits between Rotterdam and the North Sea, some of them winding through sand dunes, all of them through flat country. Rotterdam’s principal gateway is the New Waterway, an artificial cut open to the sea, slightly longer than the North Sea Canal, the entrance to Amsterdam. It is wide enough for several ships to pass at a time. 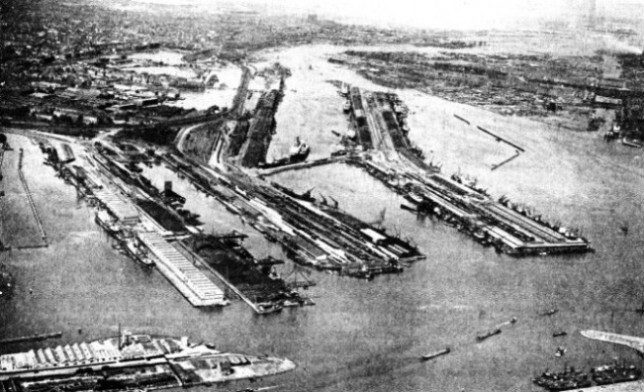 On its sides are coaling depots, oil bunkering stations and, finally, the port of Vlaardingen. This little port is the home of the world’s most famous fleet of salvage tugs. From Vlaardingen go big ships which tow floating docks from the Tyne to New Zealand, or rescue damaged vessels in mid-Atlantic and bring them in safety to port. Vlaardingen, one of the most important suburbs of the port of Rotterdam, exists mainly as a nursery for skippers and crews of ocean salvage tugs. VIEW TAKEN FROM AN AEROPLANE flying over Amsterdam. The port handles oil, timber, grain and general cargo of almost every description. It is a big transhipment port for goods from South Africa consigned to Mediterranean ports, and for Dutch Colonial products destined for the markets of Northern Europe. At the entrance to the New Waterway is the Hook of Holland. This well-known packet port is connected by mail and passenger services with the port of Harwich, in Essex. There is also a pilot station for vessels entering the New Waterway. Let us emphasize again that there is much of the practical and little of the historic in Rotterdam, although in the many basins which flank the New Waterway and in some quarters of the town there are signs of a historic past. Thus, not far from the Maas Railway Station is the quiet Wijnhaven, now flanked mainly by dignified office buildings. This is used merely by the smallest of local craft. The Railway Harbour (a small ship harbour), the Rhine Harbour and the Park Harbour are all other backwaters of Rotterdam, whose names are significant in themselves. There are also the Salmon Harbour and a small waterway called by the name of Haringvliet. In the centre of Rotterdam the Maas is split in two by an island site containing quays and warehouses. Ships tie up alongside here or anchor to dolphins in the river. This island site is connected to the mainland by bridges on either side, one of which is the Maas Bridge mentioned above. 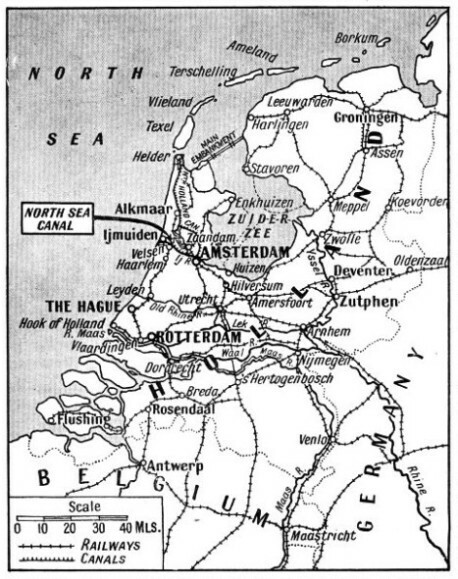 There are also two railway bridges taking a through line from Rotterdam and Amsterdam to Rosendaal and the Belgian frontier. Rotterdam, similarly to Amsterdam, is a city of bridges, no less than a city of cyclists. Appointments with shipping friends must be made with an ample margin of safety, for the visitor may be held up perhaps for twenty minutes while a group of ships and tugs passes by. By taking proper advantage of high tide, ships whose draught is as much as 33 feet can reach the port of Rotterdam with unbroken cargoes and still have a depth of 1½ feet of water beneath their keels. In the harbour of Rotterdam and the neighbouring harbour of Schiedam there are sixteen dry docks, some of which will lift vessels up to 46,000 tons. There are a number of harbours in the port of Rotterdam, some of considerable size. Parkhaven, for instance, is about 1,470 feet long and 393 feet wide. It has a depth of 21 feet and the length of quayage is 2,940 feet. Parkhaven is connected by locks with a number of inland canals. The longest quays in Rotterdam are situated on the right bank of the river. Boompjeskade is a quay 3,090 feet long. There are 28 feet depth of water alongside Lloydkade, a quay 1,740 feet in length. In the river itself mooring buoys afford accommodation for seventeen large seagoing vessels, and there is ample space for smaller vessels such as lighters or barges. In Maashaven, a harbour on the left bank with a water area of 148 acres, there is a steel floating dock with a lifting capacity of 15,000 tons. Most of the harbour craft in Rotterdam, as in Amsterdam, are self-propelled. The traveller sleeping at any hotel near the water-front is lulled to sleep by the sound of internal combustion engines or kept awake by the hoot of sirens on the waterways below. There are many ports in the world where the weather is better and upon which the sun shines more. Few ports are more picturesque than and few so well repay a visit as Amsterdam and Rotterdam. These important Northern European transhipment ports are now within an hour and a half of Croydon Airport, and within two hours of the heart of the City of London. In addition to the air routes, both Amsterdam and Rotterdam are provided with excellent cross-Channel services, including those via Harwich and the Hook of Holland and via Gravesend and Rotterdam. Both ports should be visited and studied by all those to whom ships and shipping are something more than a mere uninteresting business. AMSTERDAM AND ROTTERDAM are the most important ports in Holland. Amsterdam is an inland port that has no natural outlet to the open sea. Ships bound for Amsterdam enter the North Sea Canal at ijmuiden and after sixteen miles arrive at the great port. Another canal, known as the New Waterway, connects Rotterdam with the sea. You can read more on “Dutch East Indies Inter-Island Packet”, “Dutch Shipping” and “The Statendam” on this website. You can read more on “Reclaiming the Zuider Zee” in Wonders of World Engineering.